Talking more about one attack or reacting more passionately to it does not a narrow response make, nor does it mean you are a bigot who wants your country's doors closed to refugees. What I would like is for the hectoring posturers out there to understand that Paris, in many ways, represents the apex of Western culture. It's helpful to have celebrities guide us through these troubled times, and now, thanks to Jared Leto's speech at the American Music Awards, we know that everyone matters. It's great to have a fuchsia-haired hipster actor/musician moralist explain this to us, because we might not have heard all the other people explaining that to us immediately after the November 13 attacks on Paris. The predictable chorus went like this: "Why didn't the media cover the attacks on Beirut or Baghdad? 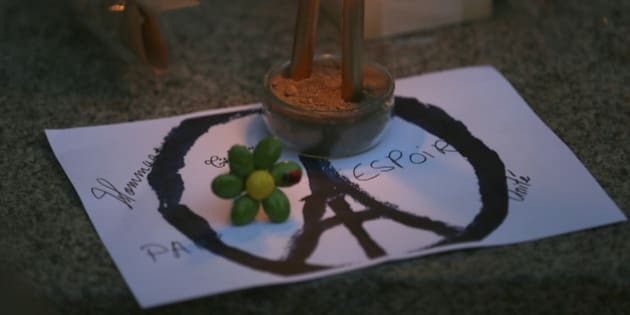 Why do you care about Paris more than Beirut or Baghdad? Yes, we mean you, person who changed your Facebook profile to an Eiffel Tower with a sort of peace sign thingy through it. And we also mean you, person who put the French tricolour on your page in some capacity." Of course, the media did cover Beirut and Baghdad. And while I did not change my Facebook page in the aforementioned ways, I don't think that reacting more strongly to one attack than another is an indication of bigotry or insensitivity, as this rather hokey poem (which apparently went "viral") asserts. On Huffington Post, someone even felt the need to point out that it isn't wrong to mourn for Paris and included in his essay the suggestion that some people won't mourn for Paris because they are "uncomfortable with France and her imperialist history." Seriously? Gosh, if we are going to limit ourselves to grieving only for those who come from countries with nothing questionable in their past, I'm hard-pressed to imagine who "deserves" our tears. "In a recent commentary about Nigeria, Rex Murphy said that 'the world is now reeling from examples of Islamic fanatics.' His point was not to trivialize the Paris attacks, but to say that the world should be as outraged about Nigeria as France. Impossible to disagree with that, and why one event gets more coverage than the other, and some victims more sympathy than others, deserves to be discussed. Israelis, for example, are routinely subjected to terror attacks and yet are often blamed for those same attacks." Talking more about one attack or reacting more passionately to it does not a narrow response make, nor does it mean you are a bigot who wants your country's doors closed to refugees. I certainly don't want the latter. What I would like is for the hectoring posturers out there to understand that Paris, in many ways, represents the apex of Western culture: countless people have visited Paris or would love to; countless project dreams or ideals onto Paris; it is on so many wish lists, so many bucket lists; we have seen it in movies and paintings and heard about it in so many songs, references that make up a big part of international references and history. I Love Paris comes easily to mind, but unless you are a Sinatra fanatic like me, you might struggle to think of a song that mentions Iraq. Some of us have been fortunate enough to have lived in Paris. I lived there for close to five years -- during part of that time I lived on Boulevard Voltaire, not far from the Bataclan. I return as often as I can, including a month-long trip earlier this year. And tragically, so tragically, we are more accustomed to hearing about attacks in Baghdad or the city once called the Paris of the Middle East than to hearing about them in Europe or North America. It does not shock to hear of a bomb in Baghdad, though it should sadden and anger us all the same. But none of these common sense explanations for the powerful global reaction to the Paris attacks stop the hipper-than-thou types from pontificating. It goes like this -- "Everyone else is upset about this, but I'm so cool I'm upset about this other thing over here that you're too much of a mindless drone to have noticed. Yes, you! All of you! You're nothing more than sheeple!" And sometimes it goes like this -- "Yes, Paris was awful, but what about this thing over here? It was worse! And you don't care and what's more, we in the West deserve it anyway because we're mean!" And blah, blah, blah. I'm sure you've heard a variation on both of those. In fact, we've all been hearing variations on that theme for the longest time. I remember on the morning of 9/11 -- I was feeling numb and horrified and staring at my TV screen -- being hit with the realization that the calibrations and rationalizations were set to begin. Begin they did and the apologists for Islamism and jihadi terrorism have pretty much not stopped since. "I've a proposal to make: what if, instead of employing the Chomsky 'but' whenever something terrible is visited on us, we tried saying 'and' instead? Not just for the fun of it but to make the world a better, bigger, more inclusive space. 'But' shrinks and grudges; 'and' amplifies and allows." Let us amplify and allow that Paris is a symbol of something greater than one city or country. I remember my father telling me that when Paris fell to the Nazis in 1940, he felt even sicker than he had felt when war was declared in 1939. He knew, he told me, that the world had changed forever and that there would not be any going back. Heck, even Leto, in his AMA spiel, admitted the Paris attacks had changed the world. So, let us stop fussing over whether everyone shows exactly the same amount of grief and worry for each and every nation, city, town and square under attack and let us focus on something more constructive -- the fact that, as Bernard-Henri Lévy writes here, "the international community possesses all of the means necessary to defeat the threat it faces, should it choose to do so."